Researchers provided recommendations and general guidance to assist MnDOT in developing cost-effective strategies for future investigation and repair contracts of post-tensioned bridges built in Minnesota before 2003. To develop these recommendations, researchers identified grout voids in post-tensioning ducts on two representative bridges, documented strand corrosion and repaired voids by filling them with grout. “With the guidelines developed in this project, we have a good basis for cost-effectively and efficiently inspecting post-tensioned bridges built before 2003,” said Dustin Thomas, South Region Bridge Construction Engineer, MnDOT Bridge Office. “From a fiscal perspective, it makes sense to do limited inspections on these bridges before committing additional resources to more comprehensive inspection and repair,” said Mark Chauvin, Associate Principal and Unit Manager at Wiss, Janney, Elstner Associates, Inc. Some concrete bridges in the United States are strengthened using post-tensioning—a method of reinforcing concrete by running steel strands through a hollow plastic or metal duct placed within the concrete element. Tension is then applied to these strands with a hydraulic jack, com-pressing the concrete and creating internal stresses that resist external traffic loads. Post-tensioning improves the durability of concrete and virtually eliminates cracking. Post-tensioning ducts are filled with grout—a mixture of cement, sand and water that hardens around the steel strands. This practice prevents the strands from corroding if they are exposed to air, water and deicing chemicals. Grouting materials used in bridges built before 2003 frequently produced voids where grout did not fully fill the post-tensioning ducts or cover the strands. These post-tensioning strands were vulnerable to corrosion, which can lead to deterioration in bridge elements over time. Once transportation agencies and the industry became aware of these issues, they improved their construction practices and began using prepackaged grout materials with additives so that the post-tensioning ducts would be completely filled. About 40 post-tensioned bridges were built in Minnesota before 2003 that might still require repair. MnDOT commissioned a two-phase project to develop techniques for evaluating these structures. In the first phase of the project, completed in 2012, researchers inspected a representative sample of these bridges and developed a general inspection protocol to guide future investigations. In the second phase, described here, researchers developed additional guidance about grout repairs, as well as the most cost-effective contracting methods for such repairs. The goal of the second phase of this project was to provide recommendations and general guidance that MnDOT could use to develop cost-effective strategies for future investigation and repair of post-tensioned bridges built in Minnesota before 2003. As part of this project, researchers identified grout voids in post-tensioning ducts on two representative bridges, documented strand corrosion and repaired voids by filling them with grout. Following bridge inspections, about one-third of discovered grout voids were filled using vacuum-assisted or pressure grouting repair techniques. In 2013, researchers inspected three spans on two Minnesota bridges for voids around post-tensioning strands. They began the project by using ground penetrating radar to map the location of the ducts. Once the ducts were located and mapped, researchers used a borescope to visually inspect the duct interiors at locations where voids were likely to be present. When they found voids, they documented the percentage of the duct filled by grout and the extent of corrosion in the post-tensioning strands within the ducts, if any. Following inspection, researchers filled the voids with grout and installed sensors within the voids at two locations to monitor the long-term corrosion of post-tensioning strands. Using their experience with these repairs, researchers then created guidelines that would help MnDOT develop cost-effective strategies that can be implemented in future post-tensioning duct investigation and repair contracts. Researchers found voids in 32 percent of inspected ducts. These voids were typically at least 10 feet long and about one-half the diameter of the duct. Although prestressing steel strands were exposed at approximately half of the grout voids, no significant corrosion of the strands was observed at any location. Light to moderate corrosion was usually observed on the inside surfaces of the galvanized metal ducts at grout voids. Typical work plans for investigation and repair, including considerations for bridge access and traffic maintenance during inspection and repair. Document review, including bridge design drawings and post-tensioning shop drawings. Visual surveys to identify signs of distress near post-tensioning ducts. Procedures for borescope inspection and remedial grouting repair. Various contract and project approaches for developing specialized inspection and re-medial repair contracts, with a discussion of the advantages and disadvantages of each approach. Using multiple contracts with graduated levels of inspection and repair will most likely provide MnDOT with the best value. Planning-level cost information for seven representative pre-2003 post-tensioning bridges identified by MnDOT to assist in future budget calculations. The guidelines developed in this project will provide MnDOT with a framework to solicit and procure similar engineering and construction services contracts for post-tensioning bridges in Minnesota. Researchers recommend exploring additional techniques to more rapidly assess and inspect post-tensioned bridges, including noninvasive investigative methods that do not require drilling holes. This post pertains to Report 2017-04, “Considerations for Development of Inspection and Remedial Grouting Contracts for Post-tensioned Bridges,” published January 2017. MnDOT recently entered into a contract with Collins Engineers Inc. to complete a third phase of research testing drones for bridge inspections, with a new focus on confined spaces. This Phase 3 project is titled “Improving Quality of Bridge Inspections Using Unmanned Aircraft Systems.” Jennifer Wells, MnDOT maintenance bridge engineer, will serve as the project’s technical liaison. Barritt Lovelace, regional manager for Collins Engineering, will serve as principal investigator. The increasing costs of bridge inspections are a concern for MnDOT. The use of unmanned aircraft systems (UAS) has been shown to reduce costs, improve the quality of bridge inspections, and increase safety. The UAS can deploy a wide range of imaging technologies including high definition still, video, and infrared sensors, and data can be analyzed using 3D imaging software. MnDOT completed a small research project in 2015 to study the effectiveness of UAS technology applied to bridge safety inspections. The project team inspected four bridges at various locations throughout Minnesota and evaluated UAS’ effectiveness in improving inspection quality and inspector safety based on field results. A second research effort demonstrated UAS imaging on the Blatnik Bridge and investigated UAS use for infrared deck surveys. Additionally, a best practices document was created to identify bridges that are best suited for UAS inspection. It is the goal, based on this next phase of research, to implement a statewide UAS bridge inspection plan, which will identify overall cost effectiveness, improvements in quality and safety, and future funding sources for both state and local bridges. Collins Engineering will also investigate a collision tolerant drone — the Flyability Elios — for confined space inspections. Review current Federal Aviation (FAA) rules, technical literature, owners and industry experiences, and ongoing UAS research. Develop bridge inspection list based on Phase II research regarding best practices. Approximately 20-25 bridges will be inspected under this contract depending on location and size. Develop a field work plan for the bridge inspection list. If approvals for these bridges cannot be obtained, suitable alternatives will be chosen. This field work plan will address safety concerns, FAA, and other agency requirements. Establish a work schedule and deliverable submission schedule. Establish methods of access and schedule equipment. Receive training on the Flyability collision tolerant drone for use in the study. Perform field work at the selected bridges to collect imagery and evaluate the technology to accomplish the project goals. Inspect known deficiencies identified during previous inspections with the use of the UAS to evaluate the ability to identify deficiencies using photos and video. Enter bridge inspection data in Minnesota’s Structure Information Management System (SIMS) providing element condition ratings, photos, videos, etc. based on UAS imagery and information. Prepare a draft report to document project activities, findings and recommendations. The Phase 3 project is scheduled to be complete by July 2018. Phase 1 of this research project demonstrated that drones can reduce safety risks and inconvenience to bridge inspectors and the traveling public. Phase 2 shows that new drones, designed with vertical and horizontal camera and sensor capabilities for structure inspections, give bridge inspectors safe access to under-deck areas that were previously difficult or impossible to reach. The new drones cost even less than the unit tested in Phase 1. 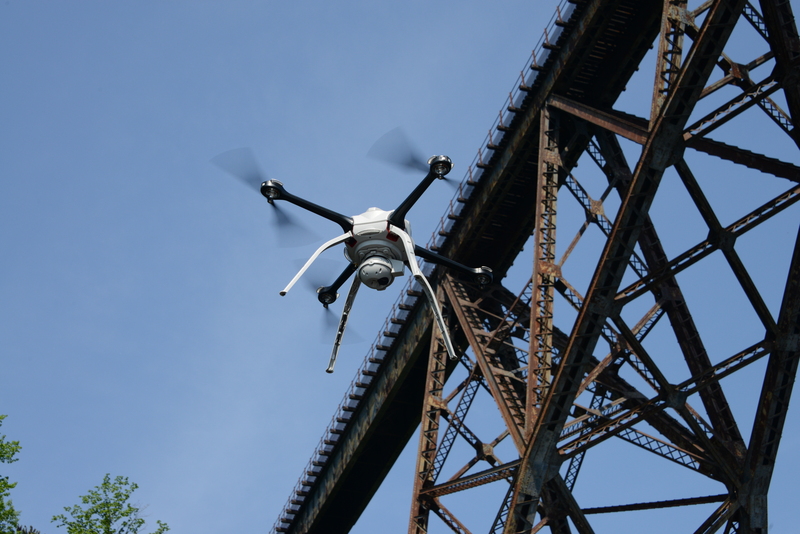 “Using a drone rather than snoopers for bridge inspection can save significant time and cost. The FHWA approves of this use as well. It’s another tool for inspectors to employ,” said Jennifer Wells, Principal Engineer on Mobility, MnDOT Office of Bridges and Structures. “We were one of the first transportation agencies and contractors to test and use this new technology for bridge inspections. Drones let bridge inspectors collect more data and collect it more safely and efficiently,” said Barritt Lovelace, Regional Manager, Collins Engineers, Inc.
MnDOT and local bridge owners have 600 bridge inspectors who monitor more than 20,000 bridges in Minnesota. Each bridge must be inspected once every 24 months. Bridges in poor condition and those considered fracture-critical (where failure of a single component could cause collapse) must be inspected every 12 months. Large bridges can take weeks to fully inspect and often require inspectors to dangle from ropes or stand in buckets on the end of “snoopers,” cranes that reach from the bridge deck to below-deck level to put inspectors within sight of under-deck elements. Snoopers are expensive and require traffic lane closures, presenting safety risks to the traveling public and inspectors. MnDOT established in a Phase 1 study that unmanned aircraft systems (UAS) significantly augment inspection findings with infrared and imaging data while reducing safety risks to inspectors and the public. The project earned a 2016 Minnesota State Government Innovation Award as well as awards and recognition from such groups as the American Public Works Association. UAS designed specifically for structure inspections were unavailable during Phase 1. The UAS used in that phase had key operational limitations, including the inability to proceed when concrete and steel bridge components blocked Global Positioning System (GPS) signals. When that happened, the drone simply returned to base automatically. In Phase 2, MnDOT wanted to test the use of an upgraded UAS to examine larger and more challenging bridges. The new UAS, which was specially designed for structure inspections, featured more robust imaging and infrared data-gathering capabilities, and was more flexible to control. Its operational capabilities also were not diminished by the loss of GPS signals. Results from UAS inspections and traditional bridge inspection methods would be compared for quality and cost-effectiveness. The Blatnik Bridge over the St. Louis River between Duluth, Minnesota, and Superior, Wisconsin, a 7,980-foot-long steel through-arch bridge with steel deck trusses. A 362-foot-long two-span steel high truss bridge over the Red River in Nielsville, Minnesota. A 263-foot-long corrugated steel culvert in St. Paul. The Stillwater Lift Bridge, a 10-span structure over the St. Croix River with six steel through-truss spans and one movable span. For each bridge or structure, researchers prepared detailed safety and inspection plans to identify and mitigate potential hazards, inspection needs and Federal Aviation Administration (FAA) requirements. Researchers conducted and evaluated UAS and standard inspection methods for each inspection site, analyzing results in terms of access technique, data collection and usefulness for interim and special inspections. The senseFly albris UAS offered a clear operational upgrade over the Phase 1 unit. It can operate without GPS; the camera lens can turn up and down at 90-degree angles; and protective shrouds and ultrasonic sensors prevent the propellers from striking bridge elements. Thermal image of a bridge deck taken by a drone. For some inspection functions, lane closures can be curtailed or eliminated altogether. The drone worked well in the high, confined spaces of the Blatnik Bridge and should provide under-deck inspection details otherwise unavailable or too costly for any tall bridge in the MnDOT system. This UAS identifies and measures clearances, rope access anchor points and other pre-inspection conditions for planning large-scale or emergency inspections. Photogrammetry software can be used with the UAS to develop three-dimensional models of bridges and bridge sites. Using infrared thermal sensors, the UAS can detect delamination of concrete while flying adjacent to lanes of traffic. For smaller, confined spaces on bridges and culverts, the senseFly albris may not be ideal. Despite its protective shrouds, it is not as collision-tolerant as needed for very tight spaces. Currently no UAS replicates hands-on inspection functions like cleaning, sounding, measuring and tactile testing. But the UAS is an additional tool that provides conventional and improved data safely. The FAA and the MnDOT Office of Aeronautics no longer require private pilot certification for drone operators. A new, streamlined certification and licensing procedure makes drone use more practical. Costs were significantly lower with UAS inspections than with conventional approaches. Conventional inspection of the Blatnik Bridge would have required four snoopers, an 80-foot lift and eight days of inspection, at a cost of about $59,000 (without the cost of mobilizing equipment and traveling). 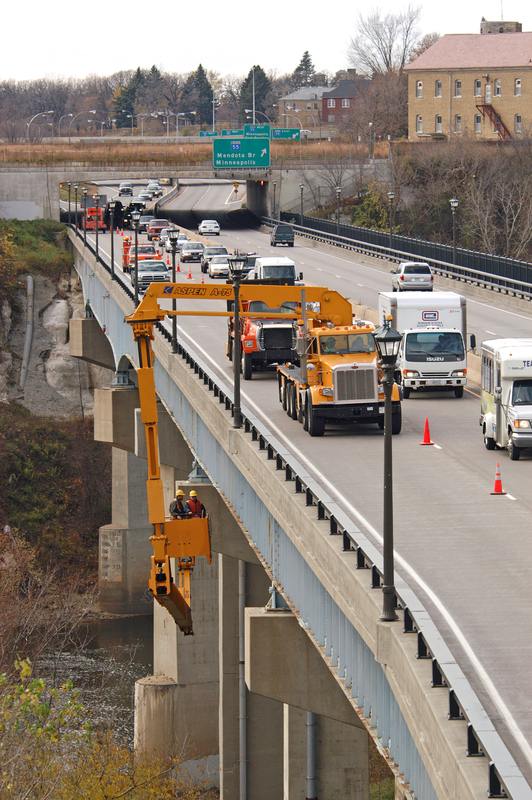 The UAS Blatnik Bridge inspection would contract as a five-day, $20,000 project. Phase 3, which began in the summer of 2017, uses the senseFly albris and the Flyability Elios, a collision-tolerant drone more suited to confined spaces such as box girders or culverts. During this phase, researchers will identify which situations are best suited for drone use, what parameters should govern drone use in bridge inspections, and how UAS can be integrated into standard inspection operations at a county and district level. This Technical Summary pertains to Report 2017-18, “Unmanned Aircraft System Bridge Inspection Demonstration Project Phase II,” published June 2017. The research project will help the State of Minnesota’s Bridge Office develop a guidance document and a tool for bridge construction time estimation to be used by MnDOT District project managers and construction staff. The tool will provide a range of production rates based on specific design criteria, being more concise based on the level of information available and will aid in evaluating the potential benefit for accelerated bridge construction (ABC) techniques. “This research will enable District project managers, who may not have bridge knowledge or background, to complete project planning and scoping more effectively,” said Paul Johns of MnDOT’s Office of Construction and Innovative Contracting. Mike Rief of WSB & Associates will serve as the project’s principal investigator. Johns will serve as technical liaison. Conduct an existing practices literature review of current departments of transportation processes around the United States for bridge time and cost estimation. Review and compile actual case study bridge construction production rates and cost data for major bridge components from state-provided diaries, schedules and bridge plans. Evaluate and select the best software format and style for a bridge construction time estimation tool. Load state case study production rate data into estimation tool and run validation using bridges currently under construction. Produce a research report summarizing the literature review on best practices. Produce a user guide for bridge time estimation tool and training presentation. An optional task, if the budget allows, will include the development of a cost estimating tool. Cost estimation data would be gathered from the literature review and case study analysis during the development of bridge construction time estimation tool for efficiency. MnDOT is researching how data and images collected by drones, such as the Aeryon Skyranger shown here, could aid bridge inspectors. In recent years, drones made headlines for fighting wars overseas, detecting crop conditions, keeping an eye on power lines and even delivering retail goods. As the flying electronic devices became easier to use and less expensive, all sorts of individuals, businesses, nonprofit groups and government organizations – including the Minnesota Department of Transportation (MnDOT) – are exploring ways to use them. This past summer, MnDOT began researching how to employ these unmanned aerial vehicles, or UAVs, to someday help inspect the state’s many bridges. The research team tested drones this past summer while inspecting four Minnesota bridges (in Chisago County, Olmsted County, Morrison County and near Stillwater) specifically selected for the study after an extensive evaluation and FAA approval. Zink and her colleagues wanted to investigate whether drones could help MnDOT decrease the rising costs of bridge inspections and collect more detailed information. Drones could also minimize the risks for bridge inspectors, who currently use rope systems and special inspection vehicles to access hard-to-reach areas. Using a drone to gather images could keep inspectors out of harm’s way and inspection vehicles out of active traffic lanes. Before simply launching drones and collecting bridge data, the research team reviewed current FAA rules and applied for the necessary exemptions. Approval was granted, but only for the use of an Aeryon Skyranger drone. Even though exemptions for several models were submitted to the FAA, none were approved in time for the field study. The team, which included personnel from Collins Engineers Inc. and Unmanned Experts, also worked closely with the MnDOT Office of Aeronautics to plan the project and gain the necessary approvals. The Aeronautics Office recently published an official MnDOT drone policy. Once in the air, the drone suitably performed a variety of inspection functions that didn’t require a hands-on physical inspection. Researchers tested the drone’s ability to gather high-quality still images and video footage of bridges. They also collected data from infrared cameras. In addition, the drone provided the ability to capture data needed to construct maps of bridge areas and 3D models of bridge elements. “The images, including infrared images to detect deck trouble spots, obtained from the drone correlate to the findings in the bridge inspection reports for specific bridge elements,” Zink said. Missing from the research were images of the underside of bridges. The drone model used in the study wasn’t able to shoot images upward from beneath a bridge, and inspectors identified that as a key feature along with the ability to operate without a GPS signal. The project’s final report listed several conclusions, including that drones can be used safely during bridge inspections and that risk to both the inspectors and public is minimal. The researchers recently were notified that they received funding for Phase 2 of their project, which is expected to start later this fall.